The architectural ensemble of the Vraca Memorial Park in Sarajevo is hereby designated as a National Monument of Bosnia and Herzegovina (hereinafter: the National Monument). The National Monument is located on a site designated as cadastral plot nos. : (old survey) 1173 and 170, (new survey) 3077 and 3078, cadastral municipality Novo Sarajevo II, Land Registry entry nos. CXXX/541 and CXXXV/72, Municipality Novo Sarajevo, Federation of Bosnia and Herzegovina, Bosnia and Herzegovina. The provisions relating to protection and rehabilitation measures set forth by the Law on the Implementation of the Decisions of the Commission to Preserve National Monuments, established pursuant to Annex 8 of the General Framework Agreement for Peace in Bosnia and Herzegovina (Official Gazette of the Federation of BiH nos. 2/02, 27/02 and 6/04) shall apply to the National Monument. The Government of the Federation of Bosnia and Herzegovina (hereinafter: the Government of the Federation) shall be responsible for ensuring and providing the legal, scientific, technical, administrative and financial measures necessary to protect, conserve, display and rehabilitate the National Monument. The Commission to Preserve National Monuments (hereinafter: the Commission) shall determine the technical requirements and secure the funds for preparing and setting up signboards with the basic data on the monument and the Decision to proclaim the property a National Monument. the dumping of waste is prohibited. In Protection Zone II the construction of industrial or agricultural buildings and facilities the use of which could endanger the architectural ensemble and the siting of environmental polluters are prohibited. Residential buildings must not exceed a height of 6.50 m to the base of the roof structure, i.e. ground and one upper floor, and maximum dimensions of 12 x 10 m. Infrastructural works shall be permitted only with the approval of the relevant ministry and on the conditions to be stipulated by the heritage protection authority. The Government of the Federation, the Federal Ministry responsible for regional planning, the Federation heritage protection authority, and the Municipal Authorities in charge of urban planning and land registry affairs, shall be notified of this Decision in order to carry out the measures stipulated in Articles II to V of this Decision, and the Authorized Municipal Court shall be notified for the purposes of registration in the Land Register. On 24 June 2004 SUBNOR Sarajevo Canton submitted a petition to designate the property as a national monument. Pursuant to the provisions of the law, the Commission proceeded to carry out the procedure for reaching a final decision to designate the Property as a National Monument, pursuant to Article V of Annex 8 and Article 35 of the Rules of Procedure of the Commission to Preserve National Monuments. Data on the current condition and use of the property, including a description and photographs, data of war damage, data on restoration or other works on the property, etc. The memorial part is in the part of the Sarajevo quarter known as Vraca on the north slopes of Mt. Trebević. The National Monument is located on a site designated as cadastral plot nos. : (old survey) 1173 and 170, (new survey) 3077 and 3078, cadastral municipality Novo Sarajevo II, Land Registry entry nos. CXXX/541 and CXXXV/72, Municipality Novo Sarajevo, Federation of Bosnia and Herzegovina, Bosnia and Herzegovina. The part of Vraca where the memorial part stands is in an area of detached houses on the hilly parts of the town, with quite extensive greenery. The memorial part is on a dominant elevation around an Austro-Hungarian fort. The complex is surrounded on all sides by roads, and covers a total of approx. 6 hectares. The position of the complex in such as to dominate parts of the quarters above which it is located – Grbavica and Kovačići – and is visible from other parts of the city as well. It stands at an altitude of approx. 642 m, which is 118 m above the altitude of Grbavica. The site offers a good view of the newly-built part of the city and views of the surrounding hills. The entire complex stands on an elliptical ridge running south-east/north-west. Morphologically, this elongated hill slopes steeply to the west and rather less so to the east and north-east down to the surrounding area. There is a small plateau on the summit, where the Austro-Hungarian fort stands. The maximum altitude of the site is 678 m. above sea level. During the Austro-Hungarian period a number of fortification-type structures were built – barracks, forts and watchtowers – around Sarajevo and elsewhere in BiH. In the late 19th century the Austro-Hungarian authorities built a fort on the slopes of Mt. Trebević in the southern part of the city, on a site designated on Austro-Hungarian maps as Vratca, a name associated with the small gate through which the fort was entered. The construction of the military fort was completed in 1898. The buildings in Vraca were constructed as a blockhouse, a stone fort of the kind erected alongside roads. During the early stages these buildings were of stone and extremely massive. Later, after 1903, buildings of this kind were of concrete and reinforced concrete. During World War II, as well as being incarcerated in Sarajevo's jails and being wounded or killed in action in Vraca and other battle sites around Sarajevo (the Merhemić brickworks in Velešići, Bentbaša, Kozija Ćuprija (Goat bridge), Hreša and elsewhere), the citizens of Sarajevo were subjected to mass arrests and deporations to the Nazi concentration camps of Europe. From May to December 1942, more than 1,300 people were transported without trial from Sarajevo to concentration camps. “More than 103,000 people are believed to have passed through Sarajevo's concentration camps during the war. Of these, 24,000 were liquidated in Sarajevo. At that time, the Vraca fortress was turned into an official execution ground where the citizens of the city of Sarajevo were killed, either individually or in mass executions. Massacres were carried out from mid 1941 throughout the entire four-year war. Mass killings were carried out, which were stepped up as the end of World War II approached. The people killed in Vraca were also buried there. The majority of prisoners killed or who died in police torture chambers in Sarajevo were also buried there. After World War II the fort in Vraca was abandoned as a military facility. Since Vraca, a battleground and scene of many casualties in the city of Sarajevo, had become synonymous with the resistance and the people's fight against fascism, it was here that a Memorial Park was built and the fort designated for museum use. The monumental edifice was opened on 25 November 1981. The construction was overseen by the Committee for the construction of the Memorial Park, appointed by the Assembly of Sarajevo City. The chair of the Committee was Rato Dugonjić. Once the Memorial Park was complete, an illustrated booklet was published in 1985. 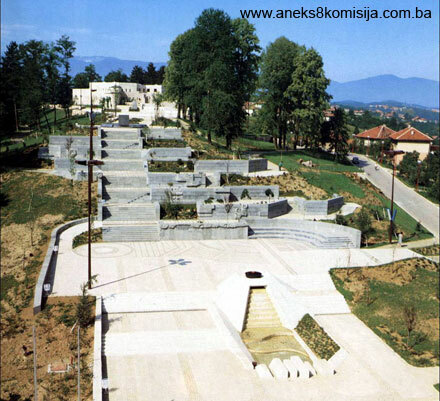 Given its outstanding strategic position, affording a good view of the city of Sarajevo, during the 1992-1995 war the Vraca Memorial Park complex was used as a position from which the besieging forces could bombard Sarajevo with their heavy artillery and where snipers were positioned. The Vraca Memorial Park was one of several positions forming the encirclement around the besieged city where heavy artillery was located. The entire complex was laid waste, both the fort and the individual memorials on the one hand and the park areas, plateaux, steps etc on the other. The memorial complex of the Vraca Memorial Park is of cultural, historical, artistic, architectural, and landscape value. It is also a memorial to the victims of fascist terror and to the Yugoslav Army troops who, with the assistance of the people of Sarajevo, liberated the city on 6 April 1945. The Vraca Memorial Park is also a complexof documentary value – a whole era in the recent history of the city is recorded in its various features. The Vraca Memorial Park contains all the elements of a complex architectural, aesthetic and landscape treatment. The architectural values are reflected both in individual monuments and in the overall treatment of the complex. It also contains a wealth of horticultural features: to the surviving fragments of the primary indigenous communities of pine forest and other arboreal species (Austrian pine [Pinus nigra], false acacia or locust [Robinia pseudoacacia] and lime [Tilia sp.] were added several groups of ornamental trees, shrubs and flowers. The skills of the designer, Vladimir Dobrović, the sculptor, Alija Kučukalić, and the landscaper, Aleksandar Maltarić, combined to achieve a harmonious composition of plant species, running water and stone, of aesthetic, ornamental, landscape and townscape value. Memorial to troops of the National Liberation Army who took part in the operation to liberate Sarajevo. The memorial to women combatants, with its stone plaque, is in the eastern part and, although physically separate from the main part of the complex, is an integral part of it. According to Džemil Šarac, there were 4,113 woman among the victims of fascist terror and genocide, and 208 women combatants were killed in action. The memorial to combatants killed in action, with the names of 2,013 people from the National Liberation Army, is one of the central components of the complex. The names of the dead are incised on granite prisms along the avenue leading from the ceremonial plateau to the memorial to national heroes. According to Džemil Šarac, these walls bore the names of 2,057 combatants killed in action during the War of National Liberation, of who 755 took part in the anti-fascist resistance in Sarajevo. Among the dead were 878 Serbs, 565 Muslims, 335 Jews, 209 Croats, and 70 others. The mausoleum of the national heroes of the city of Sarajevo, erected in 1949, which formerly stood in the Great Park, was moved to Vraca in 1981. After the exhumation of the graves, a new monument in the shape of a granite prism at the centre of a circle was erected over the tomb, and the old tombstones were stored in the History Museum of BiH. The names of 26 national heroes killed in action incised on granite blocks arranged in a circle around the central prism, by the mausoleum, are: Janko Balorda, Aleksa Bojović - Boki, Adem Buća, Mahmut Bušatlija - Buša, Miljenko Cvitković, Dušan Dašić - Pajić, Mustafa Dovadžija - Mujo, Jusuf Đonlić, Elijas Engel - Ilija, Ahmet Fetahagić - Čelik, Pavle Goranin - Ilija, Avdo Hodžić - Hodža, Gliša Janković, Ravijojla Janković, Boriša Kovačević - Šćepan, Radojka Lakić, Omer Maslić, Branko Milutinović - Obren, Vaso Miskin - Crni, Slobodan Princip - Seljo, Miladin Radivojević, Branko Šurbat - Bane and Slaviša Vajner - Čiča. The exhibition was opened on 25 November 1981 inside the fort. It was presented through enlarged reproductions of photographs, documents, coverage from newspapers and magazine articles, maps, art works, and three-dimensional artefacts. More than 750 exhibits were on display on screens and display panels and in showcases and carousels. Most of the items were the property of the Museum of the Revolution (now the History Museum of Bosnia and Herzegovina), but some (mainly photographs) had been borrowed from private individuals who had taken part in the National Liberation Movement and the War of National Liberation and then copied. During the 1992-1995 war, the exhibits in the Vraca Memorial Park were destroyed. The thematic and content framework for the exhibits in the fort in the Vraca Memorial Park has been drawn up from a synopsis produced in the Museum of the Revolution in Sarajevo in July 1981. The exhibits do not follow the synopsis in full, since at the time it was drawn up it was not known whether it would be possible to achieve certain of the solutions. The synopsis, but not the final treatment of the exhibition, has been submitted to the Commission to Preserve National Monuments in the form of documentation of the History Museum in Sarajevo, given the absence of the final treatment. the early days of liberation. In the second part of the complex, to the west, behind the fort, are several memorials expressing the gratitude of the people of Sarajevo to the Yugoslav Army troops, in the form of a large number of granite blocks on which the names of the brigades are incised, standing alongside the footpath, at the end of which is a monument consisting of two triangular granite prisms with the incised figure of Marshal Tito and his Order of the Day on the occasion of the liberation of Sarajevo. The Vraca Memorial Park is a protected cultural monument listed in the register of immoval cultural movements under no. 35 by Ruling of the Institute for the Protection of Cultural Monuments and Natural Rarities of Sarajevo, no. 09-1086-3. No conservation or restoration works have been carried out on the monument. The area of the Memorial Park is in a state of dereliction. All the damage was caused during the 1992-1995 war and a brief period after it ended. The individual components of the complex are also derelict: the fort and individual memorials, the park areas, the plateaux, the steps etc. The stone walls of the fort around the entrance gate have been pulled down, and the names of those killed in action in the atrium of the fortress have been removed; all the exhibits have disappeared. The following damage has also been observed: to the stone paving of the paths, the stone facings of the walls, the stone walls with the names of combatants. Infrastructure elements such as lighting and protective bars are also missing. 1981. Documentation of the History Museum in Sarajevo, Tematsko-sadržajni okvir postavke u tvrđavi Spomen-parka „Vraca“ (Thematic and content framework for the exhibits in the Vraca Memorial Park fortress) Sarajevo, 1981. 1985. Committee for the Construction of the Vraca Memorial Park, various authors: Nisim Albahari, Albert Altarac, Rafael Brčić MA, Marija Divčić, Mehmed Džinić, Spomen park Vraca, Directorate of the Vraca, Ivančići and Igman Memorial Complexes and Memorials, Sarajevo, 1985.